For those of us who spent endless hours speeding around on the back of a shopping cart, playing "Supermarket Sweep" with our siblings as our parents shopped, Jaebeom Jeong's "Cartrider," a bicycle-shopping cart hybrid, is a dream come true. 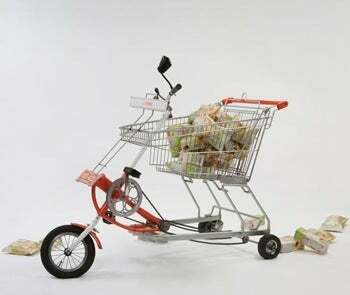 How awesome it would be to do all of your grocery shopping while cruising around on one of these bad boys? First one to the checkout lane gets 20% off on Cool Ranch Doritos! Ready, steady, go! [Designboom] via Neatorama.